Did you get a new iOS or Android device for the holidays this year? The holiday season is the high-water mark for sales of new devices, and Christmas is the day of the year that has the highest number of new device activations and app installs. In fact, there were 2.2 times the number of apps downloaded on Christmas Day as compared to an average day in the first three weeks of December. The number of apps available for these devices is staggering. As of July 2015, there were 1.6 million apps available for Android devices and 1.5 million apps available in Apple’s App Store. And yet most of us have only a few dozen apps that we use during the average week. So what are all of these other apps? While many are poorly made (crappy) apps, there are a significant number of apps that are simply ridiculous. Are these apps necessary? Do they solve real problems or add something to the world? And how many hours of design and programming have been spent on mostly useless apps? The sad reality is that many apps like GE’s parodied “Zazzies” actually exist — and while some are slightly more sophisticated than others, they are still ridiculous. Case in point: DogSync, an app that tracks when your dog was fed, taken out, or walked, and then communicates with your family who’s done what. What ever happened to just leaving a Post-it note on the kitchen counter? Or —as it’s done in my family — a “Breakfast/Dinner” note with a clothesline pin clipped to the last meal our dog was fed (see image). DogSync also sends out “intelligent reminders” for daily care of your dog. My perspective: if you need an app to remind you when your dog was last fed or walked, you probably shouldn’t own a dog. And the ‘mother’ of all ridiculous apps is Cry Translator. The app claims to identify the five distinct cries made by infants and, in 3 seconds, provide helpful suggestions that are “96% effective” in soothing your baby. Do we really need an app for that? Isn’t the whole point of parenting to get to know your baby and learn to understand his or her needs through being present and attentive? It’s certainly not about whipping out your iPhone and relying on technology over your intuition. If you need this app, you probably shouldn’t have children. Do these developers think about how to make money? Is there a long-term, sustainable business model? What is the real value the business provides? In my opinion, there are bigger opportunities that need to be solved other than blowing out birthday candles with an app. What do these apps say about consumers? Many of these apps do almost nothing but people are willing to spend money on them. For example, Lucky Cactus is #10 on the App Store’s list of paid “Entertainment” apps. The app costs $9.99 and allows you to simply tap an illustration of a cactus for good luck. That’s all it does. And there are many, many reviews of people who say that Lucky Cactus actually works. Puullease. But what frustrates me the most about all of this is that behind these ridiculous apps are talented designers and programmers. These developers are spending their time and energy creating apps that are technologically involved and advanced but ultimately serve very little purpose. These iOS and Android developers are in short supply and I believe their talents could be used elsewhere. It upsets me that these developers have decided to spend their time on gimmick apps that have no real business model. KEY TAKEAWAY: There is a shortage of talented iOS and Android developers and too much time is being spent on apps that add very little value and have no business model. We need developers to work on more important apps that solve real problems — apps like those at Punchbowl (oh, and by the way we’re hiring). Lew: Thanks so much for sharing. In my experience, great software enables customers to do great things. That article is an incredible example of how simple technology (Google Cardboard + Sketchfab ) can be used in ways that the developers couldn’t even conceive! Yes – let’s get more developers working on apps that really matter, and even save lives! Developers are hard to find. Good developers even more so. GREAT developers are unicorns. I think it’s a struggle in the business world between having an app that is awesome for a task, and so bloated to have a solution for EVERY task. Any thoughts on that, Matt? Laura, it’s a great question and something that my team is spending a lot of time figuring out. I think the small screen size naturally limits the functionality of your mobile app. Designers needs to be thoughtful about which features to put in their app and offer different solutions for features that are only available on the desktop or tablet version. The right solution is definitely NOT to try to mimic the entire desktop feature set in the mobile app. And it’s also important to remember that consumers are genererally task oriented – so they like to have apps that accomplish a specific task. In some cases, separate apps might be the right solution. 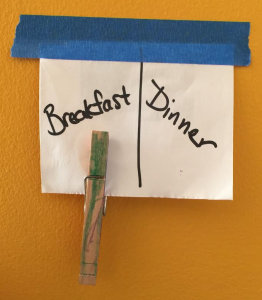 I LOVE the idea of a simple clothespin for Breakfast/Dinner. Is there an app for that?